Transportation glitches during the first week of school are expected, but some East Ramapo parents said their experiences were downright scary. Back-to-school week in the East Ramapo district began with more than the usual anxiety-inducing transportation and communication glitches, leaving some parents scrambling to track down their children, they said. Neighbors Eli Cohen and Michal Rimler of Spring Valley said their children, students at Cheder Chabad of Monsey, were dropped off at the corner of Route 306 and Brick Church Road on Friday after a bus driver reportedly refused to deliver the boys to their regular stops in front of their homes. "Essentially, the kids were all getting antsy and, supposedly, they told the bus driver to stop, so the driver pulled over and the kids got off the bus," Cohen said. His 7-year-old then walked almost a half-mile along Route 306 in the blazing heat. Rimler, whose children were on the same bus, began to panic after waiting nearly an hour for her 6- and 7-year-old sons to return home Friday afternoon. She couldn't get through to the East Ramapo transportation office on the phone, so she drove to the building on New Hempstead Road to ask for help. Instead, her concerns were met with indifference, she said. In the meantime, a friend driving on Route 306 recognized her children walking and ferried them safely home. "You know, the first few days, there's always bumps. That's normal," Rimler said. "But like this — letting kids off in the wrong places, on the main streets — this is something else." Rimler said she managed to speak to the the district's new director of transportation, Sandra Owens, who apologized. The transportation office phone line was not in service Friday afternoon and a message left for Owens at the superintendent's office wasn't returned. A woman who answered the phone at Student Bus Company, one of several transportation contractors East Ramapo uses, told The Journal News they had some snafus and late arrivals Thursday, the first day of school, but that Friday went better. The woman, who identified herself only as Dawn, said the company "just got all new routes (Thursday) afternoon from East Ramapo," which likely added to the chaos. Spring Valley resident Jenica Franklin, who cares for her 9-year-old autistic brother, also reported an unnerving experience. When the boy, a fourth-grader at Eldorado Elementary School, failed to appear at the bus stop where she was expecting him Thursday, Franklin began a frantic search, driving around town and calling the district from her cell phone. She was able to track the boy to a school bus, but it was not the one to which he had been assigned, she said. "(For the district) to not even contact a parent, it was scary," she said. "There's no sort of order. There's no sort of compassion." A message left at Chestnut Ridge Transportation, the contractor Franklin said transports her brother, was not returned. 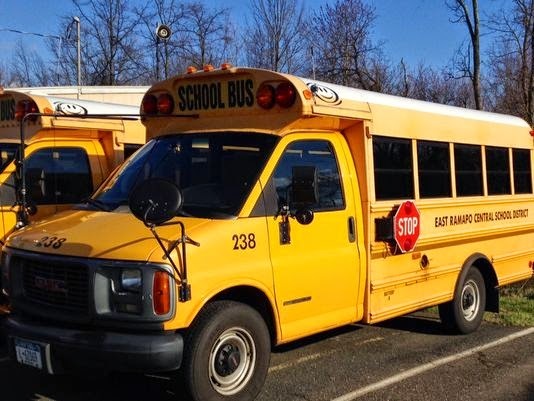 East Ramapo has about 20 fewer bus drivers this year and has taken several older vehicles off the road, cost-cutting measures the school board approved in the spring. Each year, the district lays out the money for transporting more than 30,000 students — about 9,000 from public schools, the rest from private schools — and is reimbursed by the state for about 72 percent of the cost, officials have said. About 12.5 percent of the district's $210 million budget will go to transportation this school year.